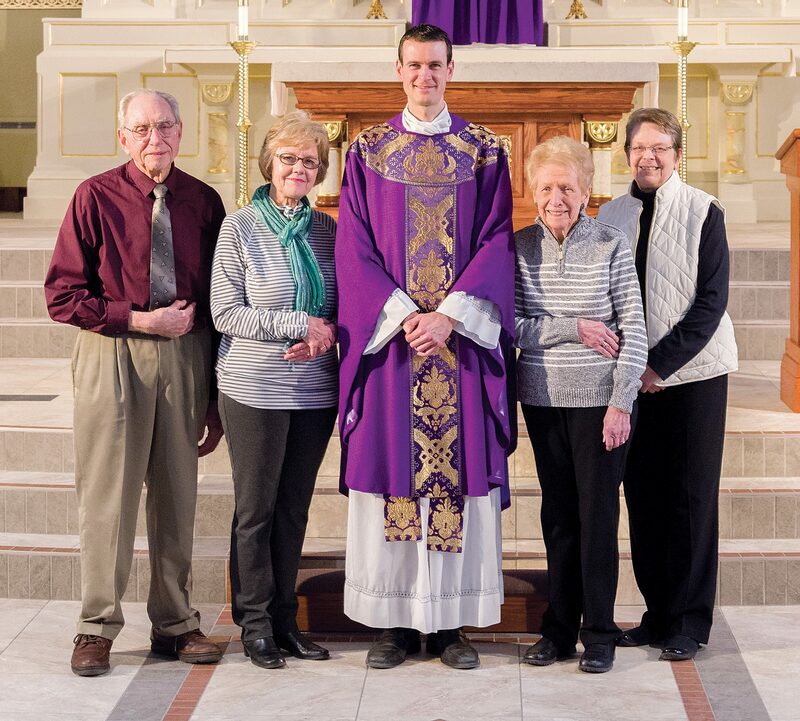 Susan DeLong and her fellow parishioners at Notre Dame Parish in Chippewa Falls have been family since before they were born. Many have parents, grandparents, great-grandparents and great great-grandparents who worshipped together from when the parish was established in 1856. .Stained-glass window in Notre Dame Church features St. George slaying the dragon. The Irish connection to Notre Dame is recognized by a bigger-than-life statue of St. Patrick erected in 1887. Susan’s great-great-grandfather arrived in Chippewa Falls from County Mayo in Ireland in 1856 with his oldest son and family and was a part of the early family of Notre Dame, which included immigrants from France, Scotland, Poland and Germany, as well as Native Americans. The first church building was a log cabin, 16 feet by 18 feet, built in only two days with a carpenter’s bench serving as the altar. The structure was expanded in 1865 to 30 feet by 90 feet to accommodate the growing number of Catholic families in the area. “This is where my great-great-grandfather used to worship. He walked three miles to Mass every day and home, winter and summer,” Susan says. Chippewa Falls was officially incorporated in 1869, and that same year Father C. Francis Xavier Goldsmith arrived and began working to build a new and larger church for his Catholic flock. The stone for the new church came from the area which is now Irvine Park, donated by William Irvine. Some of the quarry was on the property of Susan’s great-great-grandfather, and she remembers the family story of how it was hauled by oxen cart. Father Goldsmith directed the building of two other Catholic churches in Chippewa Falls as the Catholic population continued to grow. Notre Dame is referred to as the mother church of the Chippewa Valley. “Any approach into the city, you see the church,” says Susan. The campus included a grade school and high school, convent and rectory. Like every parish, the heart of Notre Dame for most families was its Catholic school. In 1907, Alexander McDonell donated and financed McDonell Catholic High School in memory of his wife and children, replacing Notre Dame High School. The parish had its own elementary school through eighth grade, as did the other two parishes in Chippewa Falls. The Holy Ghost Fathers and Notre Dame Sisters were brought to the parish, with the schools arranged by Father Goldsmith before his death. Many of the oldest families were educated in what was—until the mid-1960s—the grades 1-12 parish school design. “The east hill of Chippewa Falls was known as Catholic Hill,” Susan says. “Between 7:30 and 7:45 every morning, the doors opened up and kids came out on their way to Mass at Notre Dame. All of life centered around our family, our church and our school. Everybody was family. Our Lady of the Falls and Goldsmith Chapel are two unique and special parts of the parish. Father “Mac” built the shrine, dedicated to Our Lady of Lourdes, that looks over the city. It is built from rock from the creek bed below. Father Mac used the football team and any boys who “got in trouble” to help transport the rock. Both Bernadette and Mary are in the grotto. The shrine is a spot much loved by many people. At the end of World War II, crowds gathered at the shrine in thanksgiving. Japan surrendered on Aug. 15, the feast of the Assumption! Parishioners of Notre Dame Parish Chippewa Falls celebrate daily Mass with Father Jesse Burish. Goldsmith Chapel houses the body of Father Goldsmith who did so much for the parish. When the chapel was built on 1894, the body of Father Goldsmith was exhumed and reinterred under the altar. Constructed between the church and the former convent, Goldsmith Chapel is now used for perpetual adoration. 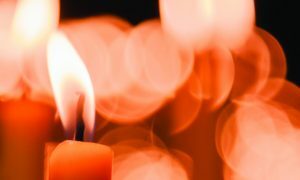 From Sunday at 7 a.m. until Friday at 10 a.m. volunteers come to pray 24 hours a day. 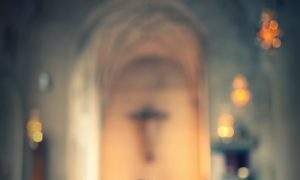 Like most Catholic parishes, Notre Dame experienced periods of change over the decades, some good and others difficult for parishioners. When Msgr. 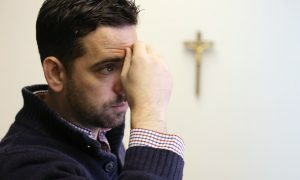 Mark Pierce arrived in 2011, he was inspired to bring Notre Dame new life. Descendants of the pioneers of Notre Dame Parish who faithfully attend daily Mass stand next to a monument dedicated to the memory of “The Pioneers” of Notre Dame Parish. 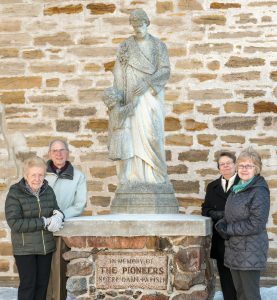 The monument has resided on the north side of the church since the 1950s: (l-r) Susan DeLong, Don Girard, Joan Hebert Hosley and Roxy Rooney Kuss (Not pictured: Mary Kelly Anderson). Daily Mass averages about 35 attendees. 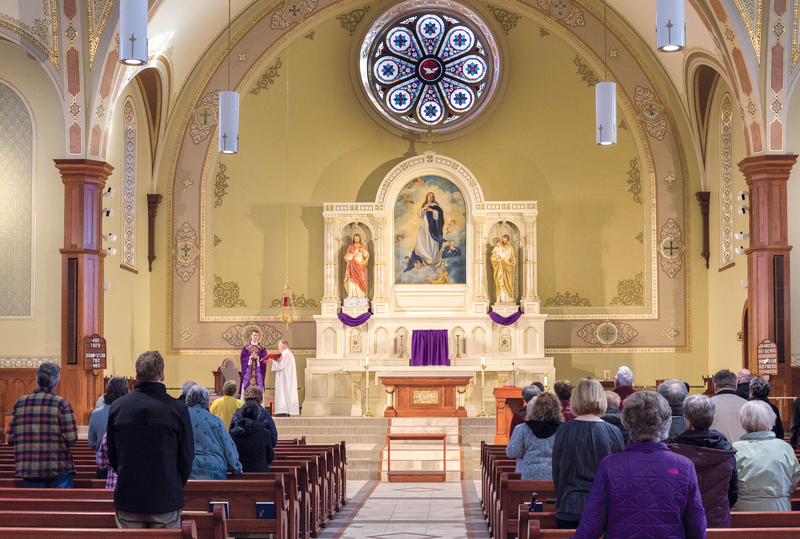 There are four weekend Masses: Saturday at 4:30 p.m. and Sunday at 8 a.m., 10 a.m. and 7 p.m.
For Susan and her peers, it is a blessing to see so many families who continue to be part of their vibrant parish. In Susan’s family, her cousin and their children are the seventh generation of the family in Notre Dame. It is much the same for other pioneer families.